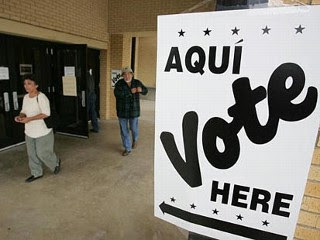 LoneStarBear: Will Growing Number of Latino Voters Turn Texas into a Blue State? Will Growing Number of Latino Voters Turn Texas into a Blue State? Michael B. Farrell, ABC News: When President Bush says so long to Washington on Jan. 20, he'll return to a much different Lone Star State from the one he left eight years ago. Dallas is controlled by Democrats; Houston is in their hands, too. It's all largely because of the state's growing Hispanic population, which overwhelmingly sided with Democrats this year. "The tide of demography in Texas is moving against the Republicans," says Cal Jillson, a political scientist at Southern Methodist University in Dallas. "All the major cities are Democratic and are likely to become more so over time." The Pew Hispanic Center reports that Latino voters sided with President-elect Obama over Sen. John McCain by a margin of more than 2 to 1, helping Democrats win crucial states such as Florida, Virginia, Nevada, and Colorado. While the overall Hispanic turnout did not rise much – it accounted for 9 percent of the vote this year and 8 percent in 2004 -- Latino support for the GOP dropped nine percentage points, according to Pew. That has left Republicans panicking and Democrats drooling. Duncan Currie writes in last week's conservative Weekly Standard that Rep. Mario Diaz-Balart (R) of Florida says the GOP has a "very, very serious problem" because of diminishing Hispanic support. If it’s Sunday, it’s still conservative.